We have available for you to hire, a full range of specialist tooling to enable you to carry out routine maintenance and repairs on your vehicle, that without this equipment, you would not be able to do so properly or easily. Even routine cambelt/camchain, camshaft, head gasket, brake, suspension and trim tasks can be impossible to carry out correctly without an investment in tools you may only ever use once. Now, the home mechanic, with the skills, but not the specialist tooling required, strikes back at the dealers and manufacturers with this new tool hire service. For a minimal fee of 20% of the new tool cost, you can now hire the tool for up to 7 days, or 30% for up to 14 days, (plus shipping), with a deposit equal to the cost of the new tool on our web site. In effect, you buy the tool, use it, and then return it to us, complete, clean and undamaged within the rental period for a 70% or 80% refund. Unless other arrangements have been made, tools are not returnable after the rental period has expired. If we haven't heard from you, we'll assume you want to keep the tool and forfeit the refund. A word of caution - you may find the tool so useful, you'll decide to keep it. You can even specify which day you would like the rental to commence on so that the tool will be available to use at your convenience, not for you to carry out the repair when the tool happens to arrive. Please read our Tool Rental Policy for details. Our tools catalogue shows some of our most popular tools/sets but we have available a vast number of specialist tools. 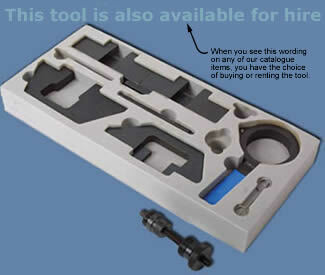 Please contact us with your requirements if the tool you need is not shown on our tool pages.